"In golf, he's definitely not exonerated," author Rick Reilly said. "There's been dozens and dozens of people that can declare him guilty of cheating"
Colluding with Russia? The special counsel says no. Cheating at golf? Well, that's something else. From pulling a fast one on Tiger Woods to exaggerating his handicap, Donald Trump's alleged misdeeds on and around the golf course are the subject of a new book by former Sports Illustrated columnist Rick Reilly, "Commander in Cheat: How Golf Explains Trump." Reilly documents dozens of examples of underhanded golf behavior by the president, cheating he says has become legendary among golfers. "In golf, he's definitely not exonerated," Reilly told The Associated Press. "There's been dozens and dozens of people that can declare him guilty of cheating." One infamous instance came in a 2017 round with Tiger Woods and Dustin Johnson, who is the current No. 1 player in the world. The president's playing partner, Fox Sports golf analyst Brad Faxon, reported that Trump's transgressions included putting down a score that didn't account for two balls he hit into the water on one hole. "You've heard so much about it, it's almost like you want to witness it so you can tell the stories," Faxon is quoted as saying. Outside of formal tournaments, golf is a game of honor in which individual players act as their own referees, keep their own scores and assess themselves penalties for rule violations. Trump's cheating, Reilly said, motivated him to write the book. Says Reilly: "I don't know much about politics, but I know golf and it really offended me, not as a voter or as a citizen — just as a golfer." Reilly quotes players who accuse Trump, his caddie and Secret Service agents of regularly moving his golf balls out of difficult lies. At Winged Foot Golf Club in New York, the only non-Trump property where the president is a member, Reilly writes, "The caddies got so used to seeing him kick his ball back onto the fairway they came up with a nickname for him: 'Pele.'" That's the world soccer star from Brazil. Sports announcer Mike Tirico says Trump once threw Tirico's golf ball off the green into a nearby bunker when they played together. Some of the allegations aren't new. Boxer Oscar De La Hoya told the AP in 2016 that Trump cheated against him twice in the space of two holes. "Yes, I caught him," De La Hoya said. "It was unbelievable. But I guess it was his course, so it was his rules." 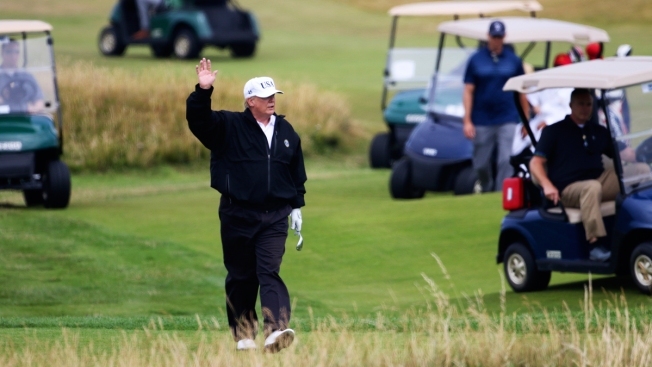 Trump, by all accounts, is a good golfer, especially for his age, Reilly writes. But the 2.8-stroke handicap he claims is the product of manipulation. A handicap is based on a golfer's most recent 20 scores and allows players of different skill levels to compete fairly against each other. Someone with Trump's handicap typically would shoot scores about three over par. Despite making more than 150 visits to his golf courses since taking office, Trump has logged only one round in the online USGA Handicap Index — and a 96 at that. Trump's love of playing belies his past criticism of President Barack Obama's regular play and his own campaign declaration that he'd be so busy in the White House, "I'm not going to have time to go play golf." "It helps to know golf, because golf explains Trump," Reilly says. The president peppers his public statements with golf metaphors, tweeting in December about the Federal Reserve, "The Fed is like a powerful golfer who can't score because he has no touch - he can't putt!" And Reilly contends Trump's early days on the course provide a window into his zero-sum world-view. Trump honed his game at Cobbs Creek, a public course outside of Philadelphia, which he later described as full of "hustlers" and where he "learned about everything." Reilly describes it as the sort of course where "everybody is trying to grift you," and where Trump learned "I got to cheat them before they cheat me." Bryan Marsal, the chair of the 2020 U.S. Open to be played at Winged Foot, told Reilly that Trump began one game with him as a partner by warning: "You see those two guys? They cheat. See me? I cheat. And I expect you to cheat because we're going to beat those two guys today." Trump is hardly the first president accused of bending the rules at golf. Bill Clinton was infamous for his "Billigans" — taking do-over shots openly and without remorse. But Reilly, who's known Trump for decades and played with him for his book "Who's Your Caddy?" recounts Trump's score-altering and other schemes as "so brazen you almost admire it." Reilly, clearly no fan of the president, said he undertook the project because of Trump's "whopper" — repeated over the course of the campaign and in the White House — that he won 18 club championships. Reilly could not corroborate a single Trump victory in a club championship, and found the president's tally includes at least one in which Trump never played on the course that day, another in which he counted the inaugural round at a yet-to-be-opened club, and 12 that were "actually senior or super senior club championships." Reilly said he's issuing Trump a challenge to defend his reputation in a match on a course that he doesn't own refereed by officials — offering $100,000 to the charity of the president's choice. Reilly, whose handicap is a 4.8, says he's confident Trump "can't cover that 2.8. No way." AP Golf Writer Doug Ferguson contributed.